Some of the top reasons homeowners experience problems with hardwood flooring involve water. Whether it’s attacking the surface of the hardwood or coming up through the subfloor, water and wood never mix — and the results are sometimes devastating. It’s important to take preventative measures both before and after your new hardwood flooring has been installed. Firstly, consider what type of subfloor you have. 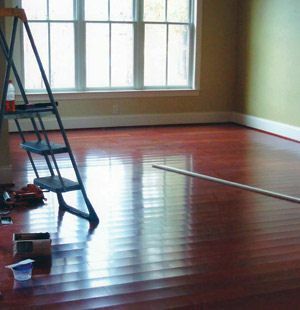 Your subfloor type will determine what kind of flooring you can actually install. For example, if you have a below grade (basement level) concrete subfloor, your best option for a real hardwood floor would be an engineered construction. With a plywood subfloor on or above grade (ground level or up), you can typically install either solid or engineered hardwood flooring. It’s always important to check with the specific manufacturer of the flooring you’re interested in to make sure they recommend installing over whatever subfloor type you have. Over either type of subfloor, on any level of the home, you’re going to want to use some sort of underlayment to protect the new hardwood flooring from any moisture travelling up through the subfloor. On a plywood subfloor, for nail or staple down installations, we always recommend using a 15lb. black felt paper underlayment for protection. If you’re floating over a plywood subfloor, you would just need to use a recommended underlayment — no extra plastic moisture barrier is necessary. Concrete subfloors are a bit trickier. Firstly, you need to check the moisture content of the concrete prior to installation. Most manufacturers recommend concrete moisture to be 4% or lower throughout the year. Because there’s still a bit of moisture coming up through the concrete subfloor, it’s important to use an engineered hardwood construction. The way an engineered board is built, it’s structurally more stable when confronted with moisture and humidity changes. 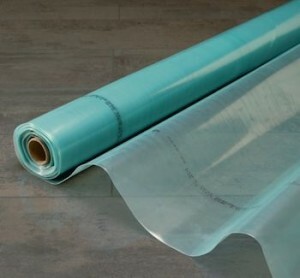 To protect the engineered flooring from being exposed to direct moisture travelling up through the subfloor, you need to use a moisture barrier no matter which installation you use. The most recommended method of installation over concrete subflooring is a floating application. This involves the use of an underlayment as a cushion between the subfloor and the new engineered hardwood flooring. Most underlayments these days have moisture barriers already attached, which is perfect for installation over concrete slabs. In basements, we actually recommend adding a second layer of 6mil plastic prior to installation of the engineered as extra protection against moisture transfer. This extra protection will help prevent any trouble down the road. Engineered flooring can also typically be glued down directly to the concrete subfloor. It is recommended to apply a moisture barrier in a liquid form (MVP) and let it dry before using the hardwood flooring adhesive to glue down the engineered flooring. Failure to take proper precautions when installing hardwood flooring could lead to cupping, buckling or warping of boards. To the left is an example of cupping boards. You can see the edges of the boards rounding up slightly. This isn’t normal for hardwood flooring and if the proper moisture tests weren’t done or if the recommended underlayments weren’t used to protect against moisture transfer, the warranty would not cover this defect. After installation of new hardwood flooring, solid or engineered, proper care will ensure your flooring will stay beautiful longer. Any spills should be cleaned up right away and any leaky appliances should be fixed as soon as possible or moved away from hardwood flooring. Standing water and continued exposure to water can permanently damage hardwood flooring, as water and wood never mix. Proper cleaning of hardwood flooring is important, too. Never use a soap and water combination, but, rather, only use approved cleaning solutions and your hardwood flooring will stay beautiful for years and years. To the right is an example of hardwood flooring that had been exposed to water coming in from a leaky roof. This is a common problem with hardwood floors where wet towels are often left or in places where leaks go unnoticed. You’ll notice black edges, discoloration and severe gapping. There is no way to fix this type of damage, short of replacing the entire section of the floor, and it’s definitely not something covered by any warranty. Popular on store shelves right now are steam cleaners, vowing to be safe and effective cleaning tools for any hard surface, including real hardwood flooring. Consumers believe this marketing, use steam cleaners on their hardwood flooring and ultimately are disappointed with the results. With these steam cleaners, you’re forcing extra moisture, heated, into the pores of the real wood. Over time, this steam will start to affect the finish and the hardwood flooring’s structural integrity. This entry was posted on Tuesday, May 7th, 2013 at 11:35 am	and is filed under Engineered Wood Flooring, Floating Wood Floors, Solid Hardwood Flooring, Wood Floor Underlayments. You can follow any responses to this entry through the RSS 2.0 feed. You can leave a response, or trackback from your own site. 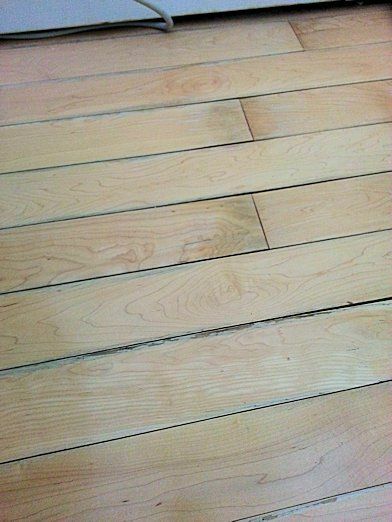 I live in Florida where humidity is high, but I really like the solid wood option for a flooring vs. engineered. I’ve read the potential pit falls with using glue down solid plank flooring. I have found some solid wood products that can be clicked together and floated ,with a vapor barrier, over the concrete slab. My question is, Would installing solid wood in this manner allow for the natural expansion and contraction of the wood, and moisture absorption from the air, without the buckling and swelling effects? We’ve worked with solid click lock products in the past with terrible results, so we don’t sell them anymore. There was just too much expansion and contraction when the moisture in the air changed. We would recommend going with a click lock engineered floor like Kahrs, Boen or Baltic. All three products are excellent quality with thick wear layers and are perfect for installs in atmospheres that may have a higher moisture content. What about City Mill click and lock. I have started. I am using Black Jack underlayment. It does seem like some of the click or the lock part are not 100%. In this case, can I glue. I live in Hawaii. I hope this is the right thing to do. I am using blackjack underlayment. It is much harder than every video I have seen. You would need to consult the manufacturer’s installation instructions. Some manufacturers of click lock flooring prefer it only to be floated while others allow for glue down applications.